Not Just Another Mother Blogger! : The A to Z April Blog Challenge! The A to Z April Blog Challenge! I started blogging as a way to record my adventures as a parent so I would remember them. I also secretly missed writing and wanted a way to get myself back into the writing groove once more. I have enjoyed participating in the The Red Dress Club as a way to spread my creative wings and have fun, but I thought that perhaps I needed something else. 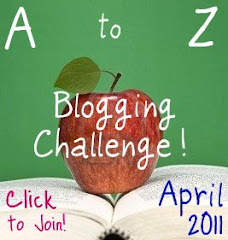 With that in mind, I decided to sign up for the A to Z April Blog Challenge. The challenge, as far as I can tell, is to write a blog each day in April that begins with every letter of the alphabet. Sundays are 'off', which leaves 26 days to the month for blogging. So the first letter of my blog on April 1st should begin with the letter 'A'. I have no idea what I'll write when the day is 'Q', but I guess I'll figure it out as I go. Wish me luck! Or is it more appropriate to wish a writer something like 'Good Spelling!' or 'Don't let your participles dangle!'? You've got the concept down fairly accurately. Watch what others are doing to see the varied approaches others will take. I'm sure you'll do well. Have fun! Yes Q's going to be a tricky one :D I'm looking forward to the fun it's going to be though.